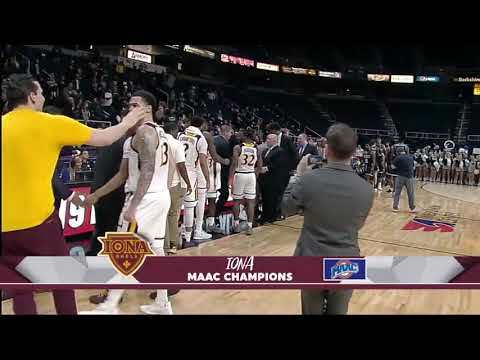 The Iona College men’s basketball team is going dancing once again, claiming its record fourth straight Metro Atlantic Athletic Conference championship after topping Monmouth on Monday night to take the title. The Gaels become the first team in MAAC basketball history to claim four straight championships and it is their league record 12th title. Their appearance at the NCAA Championship will be their sixth in nine seasons under head coach Tim Cluess. To get their spot in the NCAA Tournament, the top-seeded Gaels downed the sixth-seeded Hawks 81-60, led by senior Rickey McGill. Despite battling foul trouble late in the game, McGill finished with 10 points, four rebounds and three assists to claim the MAAC Championship’s MVP crown. He becomes the only student-athlete in MAAC history to claim four conference championship rings. Iona College will now play the waiting game, until Selection Sunday, March 17, when it will find out their placement and opponent for this year’s NCAA Tournament. Officials said that there will be a watch party at the Hynes Center for students and fans.